Yum, fall always makes me think of good Old Fashioned Candy Apples. Apple season always have me craving all the yummy apple recipes I enjoyed growing up. As a child I recall loving those bright Red Candy Apples at the end of summer carnivals. As an adult I still love them I just do not care for the price ha ha. Last week we had the kids out at a local event and of course they spotted candy apples instantly. The thought of spending $4.25 each really made me cringe. So, I plead with them to wait until we got home and we could make our own for a fraction of the cost. 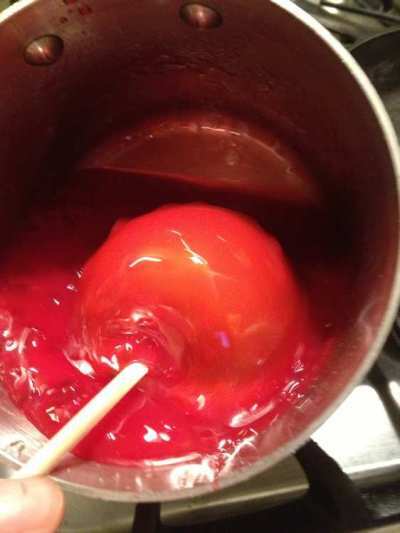 I knew making our own Old Fashioned Candy Apples was not that difficult and they would taste just as good if not better. 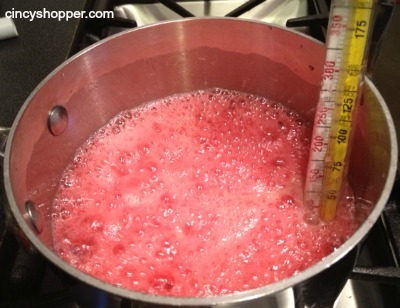 Combine sugar, corn syrup, water and candy in a saucepan and bring to a boil over medium heat. We are going to cook the mixture until it reaches 245 which is firm ball stage. While this is cooking, twist the stems off the apples and insert sticks. Now we remove the sauce from the heat, remove the thermometer and add the food coloring. We then take each apple and dip it in the mixture, twirling it in order to get complete coverage of the apple. Hold the apple above the pan for a few seconds to allow any excess to drip back in the pan. Don’t place these on wax paper or they will stick. You need to use either a silicon baking sheet of just spray a cookie sheet the vegetable spray. You will notice that you will get some bubbling and these are not going to be perfect “looking” but wow, the taste is amazing. I think I ate half of this batch all by myself ha ha. You can top with nuts, sprinkles or even candies. Looking for other Apple and Fall Recipes? If so see all of my additional apple foods here. I love candy apples! My name is Katie and I host Fall Into the Holidays, open Saturdays! I’d love to have you link up! Thanks for sharing this great recipe! I’ve always wanted to try to make these myself :) Have a nice day! Yummy, I bet these are delish!! Thanks for sharing at our All Things Thursday blog hop :) Have a great weekend! 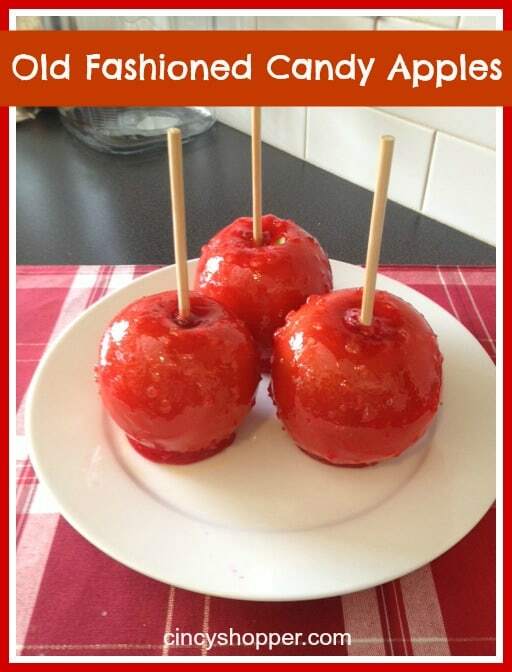 I love Candy Apples these look awesome! Thank you so much for sharing with Full Plate Thursday and hope your weekend was great! 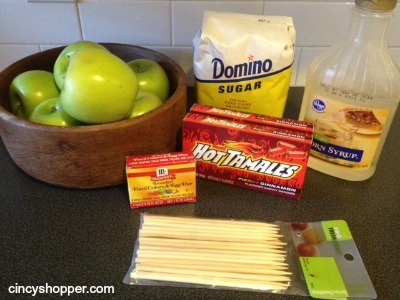 Perfect timing, my daughter just asked me if we could make candied apples. Thanks for the recipe. Thanks for sharing at Inspire Us Thursday on Organized 31. I’m following this recipe to a t and I can’t seem to get it to stay on the apple or harden. What is happening?